Congressman Walz's participation in the House Agriculture Committee's hearing on credit derivatives is capturing national attention. The Washington Times has posted the AP report, Credit default swaps targeted, along with the photo of slot machines. The caption says it all: "Credit default swaps turn out to be more unregulated than gambling..."
Debt insurers, say hello to government regulation. Say farewell to voluntary compliance and disclosure. Congress and financial regulators for the first time appear willing to impose rules on obscure financial contracts that are increasingly being blamed for igniting the global financial crisis. "Please excuse the healthy skepticism of my constituents," Rep. Tim Walz, Minnesota Democrat, said Wednesday during a House hearing, referring to the relative free rein given those involved in so-called credit default swaps. "They're not buying that right now." Republicans, traditional opponents of regulation, acknowledge that Congress needs to lay down the law. "There are at least some limits to market economics that we're going to have to make," said Sen. Richard G. Lugar, Indiana Republican, during a hearing earlier in the week. Lawmakers and state and federal regulators are a long way from agreeing on specifics. But they're marching in rare bipartisan lockstep toward making the terms of credit default swaps transparent and subject to government supervision. . . .
KSFY: Going into your Congressional hearing, you said the use of credit derivatives had the American economy operating on a "...Vegas casino mentality..." Did you find that to be true? Walz: Well, that's pretty much what the experts said. This was held in the Agricultural Committee hearing and it's the Commodities Futures Trading Commission. It was dealing specifically with the credit default swaps. These are kind of shadowy backroom deals that equal 55-trillion dollars. They were at the heart of bringing down AIG and the problem with them is: there is no oversight to them. There is no one that knows who's trading these things, how leveraged they are, and the risk was obviously one of the contributing factors in the problems we're experiencing in the economy. Go read the rest at the station's web site.Earlier, KEYC-TV covered the hearings in Rep. Walz on Legislative Investigation Into Wall Street Meltdown. 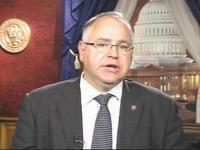 . . .Walz, who sits on the committee, returned to Washington on Wednesday to attend the hearing. He pressed witnesses to understand citizen anger over apparent manipulation of the markets through the unregulated derivatives, and called on the government to be vigilant about future unregulated financial tools.
. . ."It's about bringing back trust. I keep coming back to that," he said. "People want to know that these people are being asked to play by the rules and that the investments are on the up and up and that they're not in the shadows." Walz, who voted against both versions of the $700 billion Wall Street bailout package said the initial anger over the bill has subsided somewhat, but constituents still want to know what is being done to prevent another crisis. "They've lost trust, they've lost confidence," he said. "So anything we can do to restore confidence, I don't know that you can measure in sheer numbers, but they want to know ... that somebody's minding the store, somebody's got to make sure this doesn't happen again, and somebody's looking out for their interest." . . .Polling information on the race has been scarce, but what has been released so far has shown Walz with a lead. Even a poll released by the Davis campaign late last month to illustrate a shift in momentum in Davis' favor had Walz, a Mankato high school teacher, with an 18-point lead. The Web site Realclearpolitics.com, for example, doesn't include the 1st District race among its rankings of the top 50 seats most likely to switch parties. We missed that one. Check it out yourself here. . . .Meanwhile, the Walz campaign continued to hammer away at Davis for supporting a partial privatization of Social Security, an idea Walz spokesman Chris Schmitter called the equivalent of "gambling away on the stock market." "In this economic climate, when he's talking about a plan to partially privatize Social Security, that right there is an indication that's not what people want," Schmitter said. Events have not necessarily conspired to help Davis' campaign. In debates, Davis has pledged to keep the promise of Social Security, but has argued that young workers should be given the option of diverting a portion of their Social Security contributions into private accounts. But his argument has come at a time when the stock market has plunged in value. . .
Read the whole article at the Post Bulletin. Since Davis had not yet released his fundraising report to the FEC nor released any numbers to the press, the article doesn't consider how the Davis campaign is Not waving, but drowning.